There is a common misconception that video games are an “in the moment” medium, and that whatever the current landscape of gaming is is guaranteed to be its apex, knocking yesteryear’s games to irrelevancy. While it’s true that video games are a bit more susceptible to age than other mediums given both their interactive mechanics and that technology advances so quickly these days, plenty of titles from gaming history stand the test of time, proving that fun and creativity aren’t bound to the technology that presents them. And perhaps no game has better stood the test of time than Tetris. The brainchild of Alexey Pajitnov has remained a touchstone in gaming for over three decades, shaping the puzzle genre and seeing a re-release on any and every platform that’s capable of playing video games to this day. Tetris Effect – the PS4 exclusive named after the real world psychological effect Tetris can have on the mind – is but the latest iteration of the timeless puzzler. 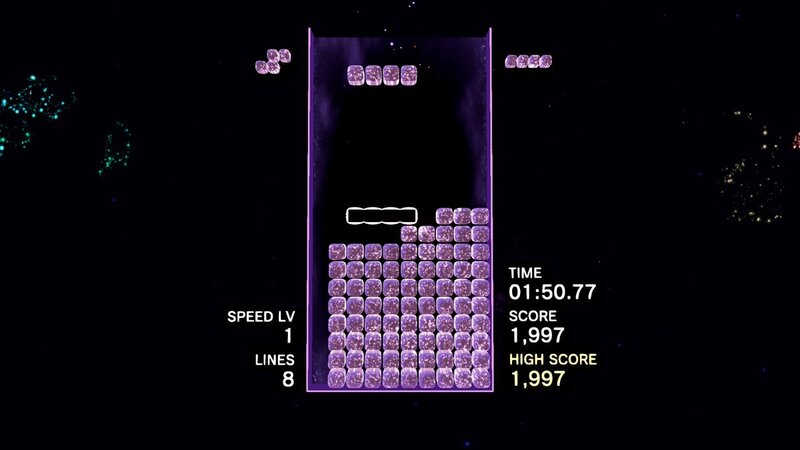 While the ageless masterpiece remains intact, a few additional modes, along with some spectacular visual effects and music, make Tetris Effect feel like the go-to version of Tetris on contemporary hardware. The core gameplay is, of course, as it’s always been: block pieces fall from the top of the screen, and players have to fit them together into full rows, thus eliminating them and racking up points. The blocks (called “Tetrominos”) come in seven different shapes, and as the game goes on and the blocks drop faster, the player has to think fast in order to continuously complete rows to keep the game going. There is a new addition to the classic gameplay, however, with the ability to enter “the Zone.” By eliminating rows, you gain energy, and once enough energy is stored, you can enter the Zone at the press of a button. While in the Zone, time freezes, and the blocks no longer fall on their own. This gives the player some time (until the energy runs out) to complete extra rows and earn additional points, and can be a real godsend when the speed really picks up in the late game. 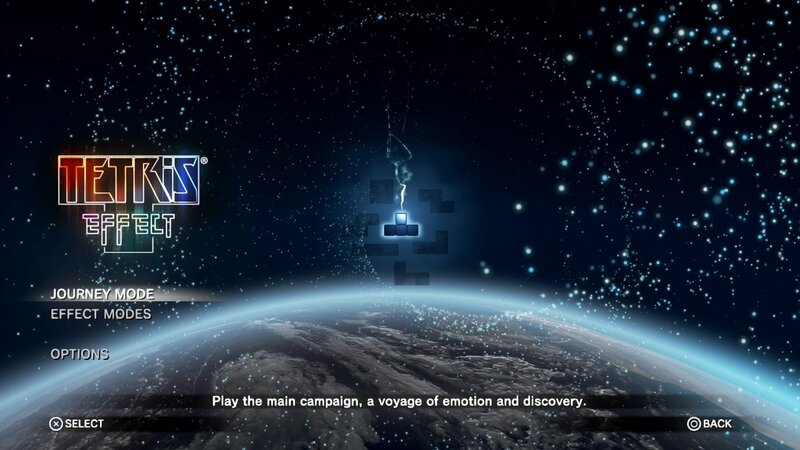 Tetris Effect features a kind of campaign mode, in which the player has to complete twenty-seven different stages in order to complete the game. While all these stages can be replayed once completed, in order to progress in the ‘story’ players have to complete 36 rows on each stage (save for the last, which requires 90). The stages are separated into different ‘worlds,’ and if you perform well enough on each stage, you can complete a whole world without continuing for an even greater score. While the only gameplay difference between stages is the difficulty, every last stage boasts its own visuals and musical score. And, my word, what fantastic visuals and music they are! 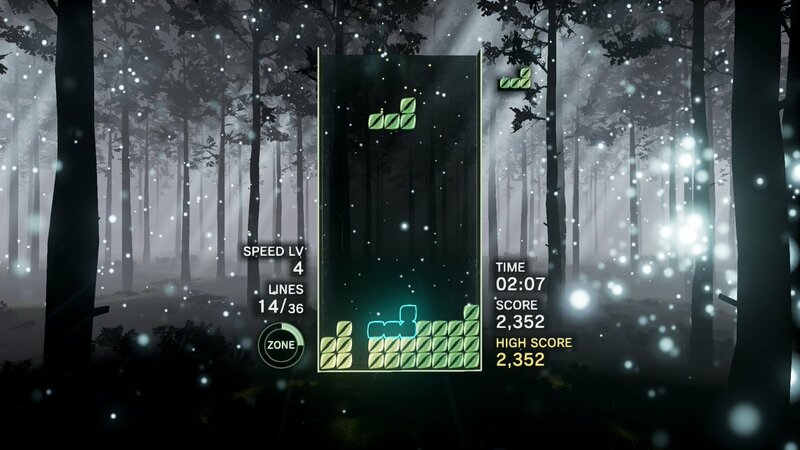 Each level is an audial and visual wonder, with brilliant little touches added to the experience, such as each fallen block adding a beat to the music, and a surprise visual effect accompanying the completion of a Tetris (four rows at once). Tetris Effect is a stunningly beautiful game, but its aesthetic wonders aren’t so much a display of PS4’s hardware capabilities (though they are that too) so much as they are used to showcase an almost spiritual reverence for the Tetris experience. This isn’t merely another port of Tetris, but a gushing love letter to the iconic puzzler. Every audio and visual pleasures serves as its most blatant means of worship towards the grand daddy of falling block games, and to give the player that same level of reverence for Tetris. There are a number of additional modes added to the mix to keep things fresh. One sees players trying to eliminate ‘cursed’ blocks by completing the rows they’re found on, with more cursed blocks spawning after an allotted time. One of my favorite new modes will count down a set number of blocks, and after said blocks are placed, a line block will automatically fall into a designated spot, leaving the player to strategize around the inevitable line blocks. The new modes are fun and plentiful, and give a variety of alternatives for when you want a change of pace. 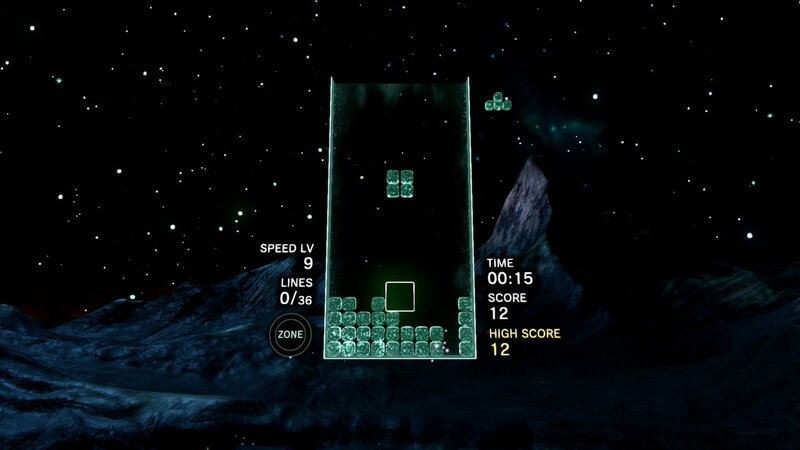 Sadly, there is one glaring omission with Tetris Effect: it lacks multiplayer. Though players can check out other player profiles around the world and see what modes they’re currently playing or prefer to play, you can never actually play a round of Tetris with another player, whether locally or online. This is more than a little disappointing, given that puzzle games are often at their best when they bring out the competitive nature in multiple players (see Tetris Battle Gaiden). 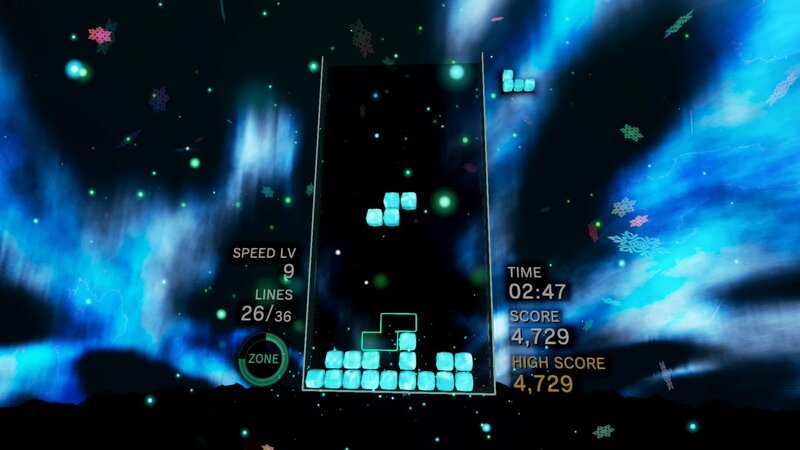 And with the fun new modes Tetris Effect brings to the table, it makes you wish the game would have put that same inventiveness to the test for a multiplayer mode (even something as simple as two or more players taking turns in placing Tetrominos on the same board would bring a fun new twist to the formula). 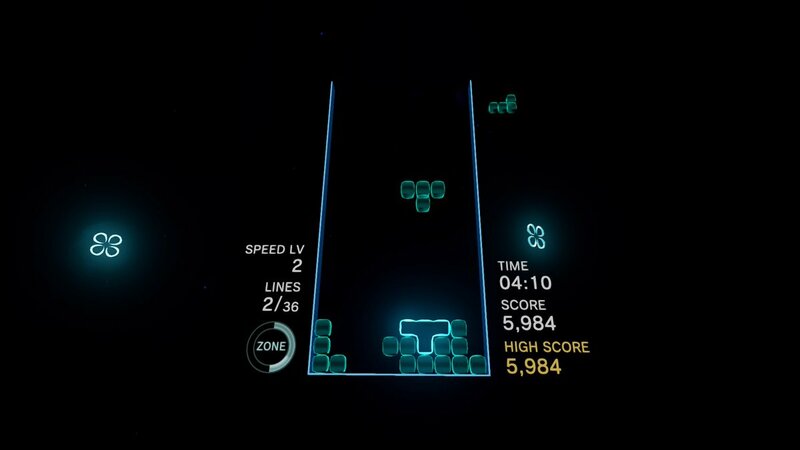 For all the many things Tetris Effect gets right, the absence of any kind of multiplayer mode feels like a missed opportunity. 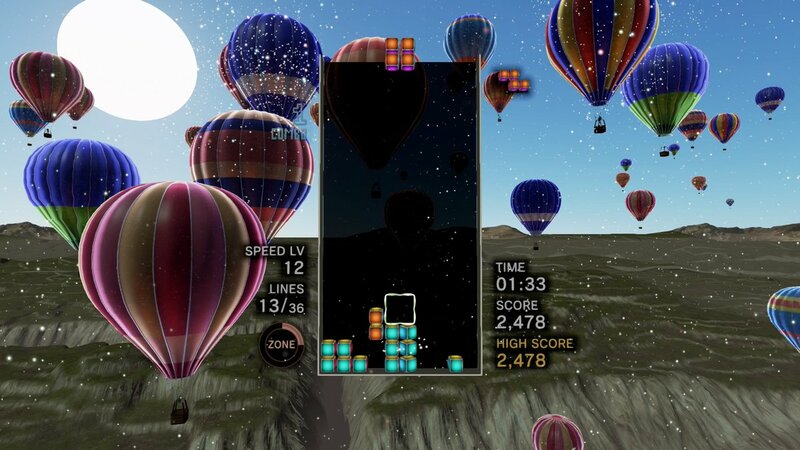 Tetris Effect may not reinvent the timeless formula Alexey Pajitnov created over three decades ago, but it does deliver an undeniably beautiful experience that may just deepen your appreciation for what is the most accomplished of video games. Tetris Effect expresses such a devout admiration for its source material that it’s impossible not to be taken aback by it.